WIN Semiconductors, the world’s largest pure-play compound semiconductor foundry, has expanded its gallium nitride (GaN) process capabilities to include a 0.45µm-gate technology that supports current and future 5G applications. The NP45-11 GaN-on-SiC process allows customers to design hybrid Doherty power amplifiers used in 5G applications including massive MIMO (multiple-input and multiple-output) wireless antenna systems. Similar to macro-cell applications, MIMO base stations often combine Doherty power amplifiers with linearization techniques to meet demanding linearity and efficiency specifications of today's wireless infrastructure. GaN devices outperform the incumbent LDMOS technology, offering superior efficiency, instantaneous bandwidth and linearity, particularly in the higher frequency bands utilized in 5G radio access networks. Ideal for use in sub-6 GHz 5G applications including macro-cell transmitters and MIMO access points, the NP45-11 GaN-on-SiC process supports power applications from 100 MHz through 6 GHz. This discrete transistor process is environmentally rugged, incorporating advanced moisture protection and meets the JEDEC JESD22-A110 biased HAST qualification at 55 volts. Combined with WIN Semiconductors’ environmentally rugged high voltage passive technology, IP3M-01, the NP45-11 technology enables hybrid power amplifiers in a low cost plastic package. The technology is fabricated on 100 mm silicon carbide substrates and operates at a drain bias of 50 volts. In the 2.7 GHz band, this technology provides a saturated output power of 7 watts/mm with 18 dB linear gain and more than 65% power added efficiency without harmonic tuning. 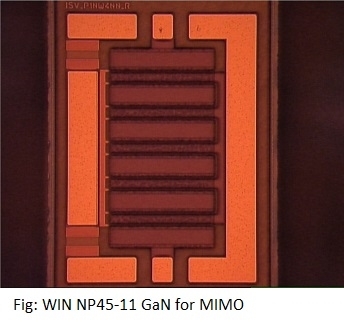 According to David Danzilio, Senior Vice President of WIN Semiconductors Corp, 5G radio access networks create several challenges for power amplifier designs used in MIMO systems. High output power and linear efficiency are the primary design objectives to meet performance specifications along with a lower total cost of ownership. The tradeoff between output power and linearized efficiency is significant because of the high peak-to-average power ratio employed in today’s wireless modulation schemes. This tradeoff becomes more difficult in 5G applications due to greater instantaneous bandwidth requirements and higher operating frequency. David Danzilio will be presenting a paper at the the IEEE International Microwave Symposium (IMS 2018) 5G Power Amplifier Technology Workshop Today (June 11th 2018). WIN Semiconductors will also be showcasing its compound semiconductor RF and mm-Wave solutions in stand 415 at the event scheduled in Philadelphia, PA from June 12-14, 2018.